A month ago, I was telling you about the exciting Textile Symposium held in Bangkok which brought together a crowd of experts to discuss the topic « Weaving royal traditions through time at the Thai court and beyond ». 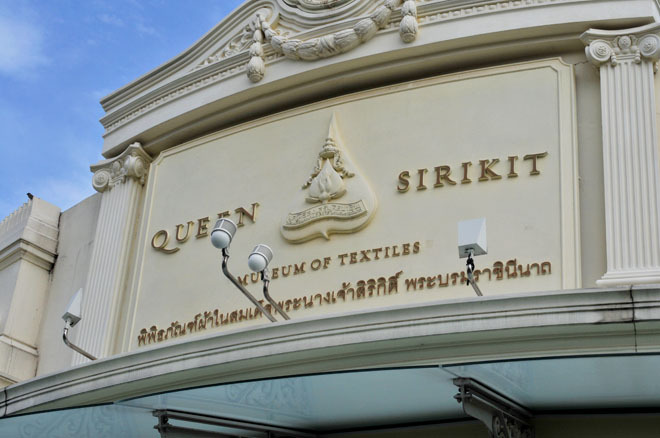 It is now time to present you the Queen Sirikit Museum of Texiles, which we also get a chance to discover in a tour during our days in the Thai capital. Opened in 2012, the museum is located in the former building of the Ministry of Finance completely renovated for the occasion, two steps away from the Royal Palace. 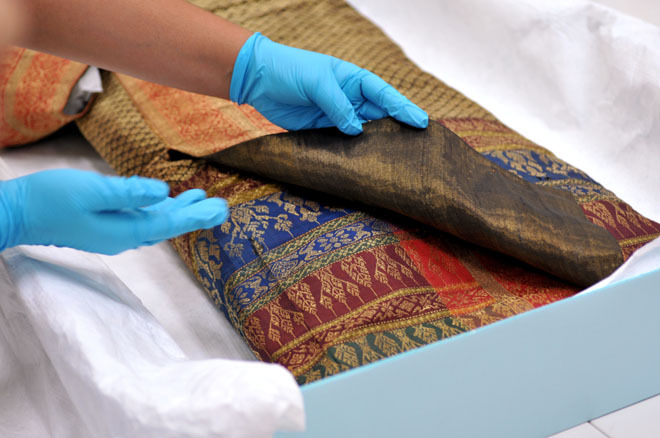 It features the Queen’s magnificent ceremonial costumes, some remarkable textiles collections from Thailand and South East Asia. 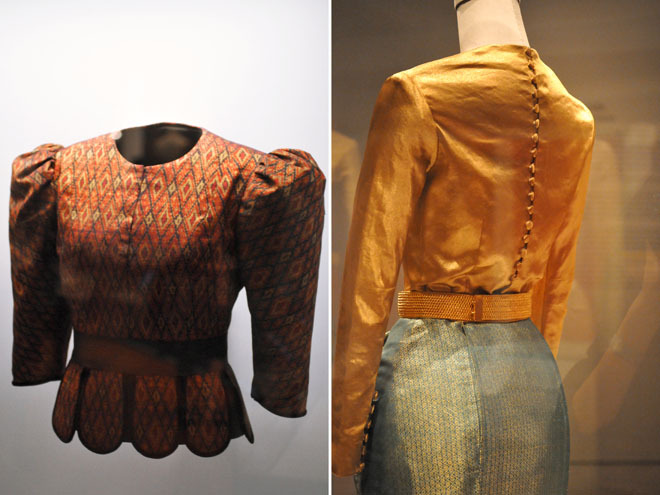 The museum intends to position itself as a research center for all textile lovers, offering also temporary exhibitions highlighting various aspects of the textile archives. 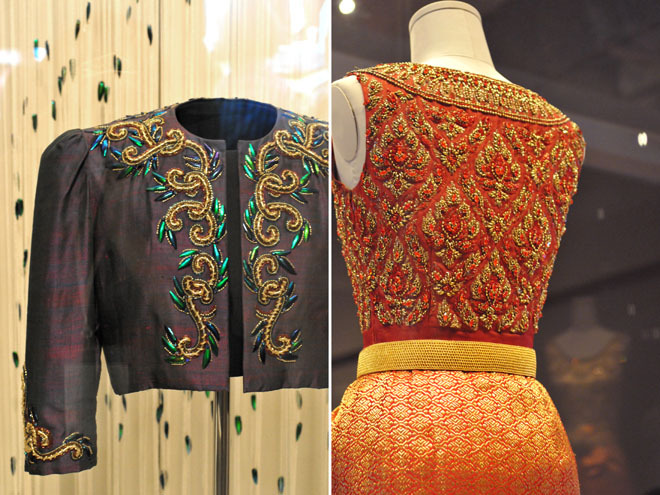 I was impressed by the refinement of the Queen Sirikit outfits, all embroidered with pearls and bee shells, and tailored in spectacular silk brocades. It has to glitter! Her Majesty is also a queen of style, with a true sense of fashion. 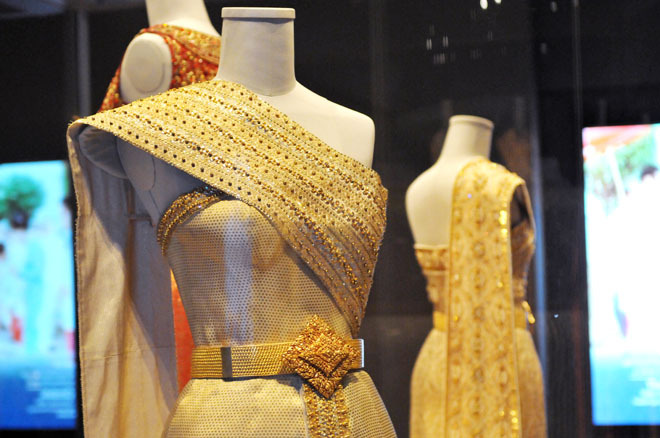 I learned and discovered her long-standing collaboration with Pierre Balmain on the design of her dresses and how she created the Thaï National Women’s Dress in the 1960s : a cleverly draped silk tunic of outstanding elegance. 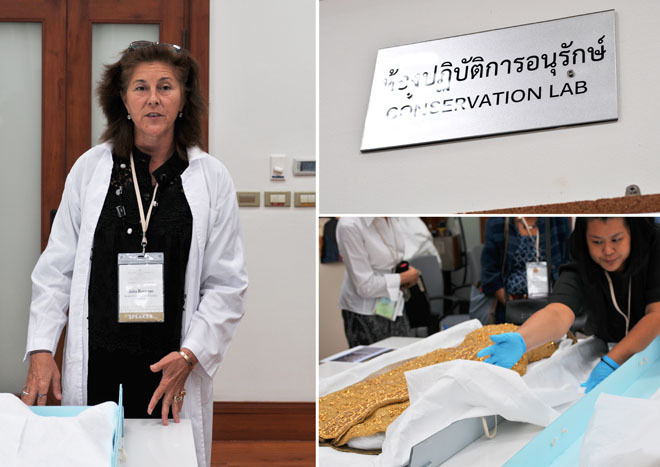 On the left, the chief conservator Julia Brennan is presenting the conservation lab. This department plays a vital role in the preservation of the museum’s collections. 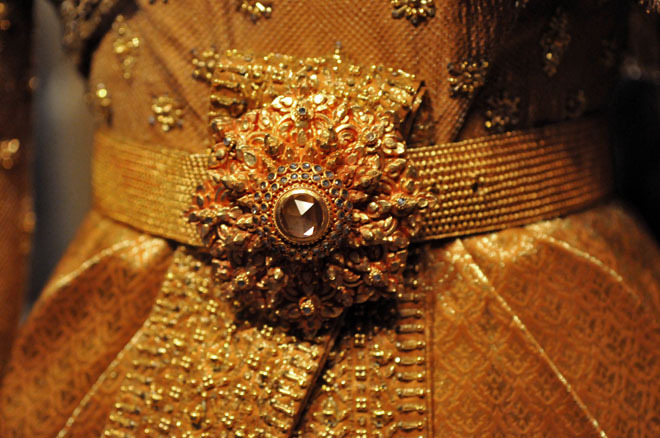 Details of the Thai National Dress. 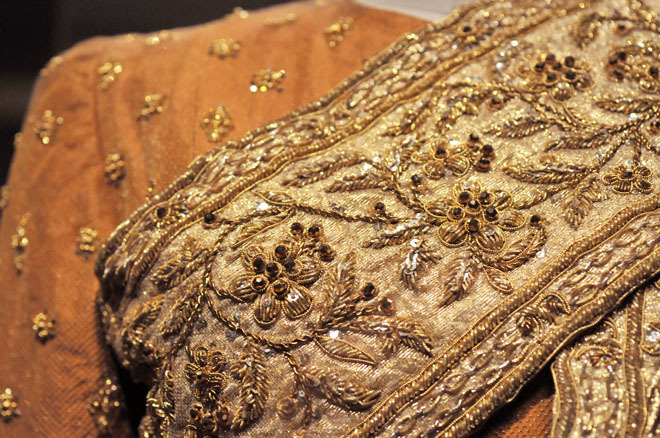 On the left, silk jacket embroidered with gold thread and beetles shells raised for this purpose. 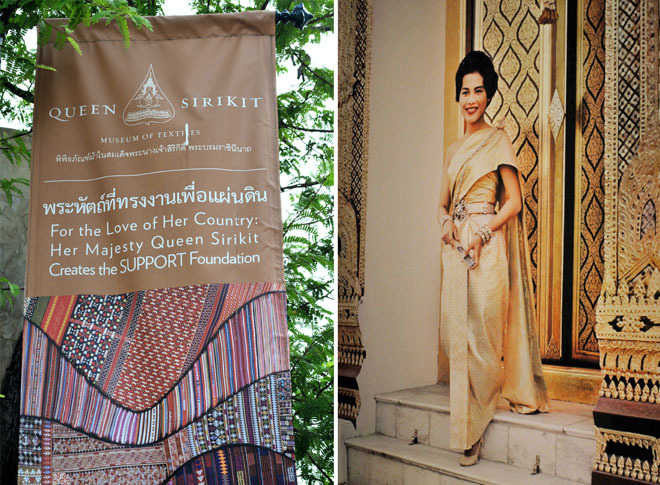 Examples of Her Majesty Queen Sirikit outfits, from her personal collection.